A private team is preparing to make contact with a 36-year-old NASA spacecraft after reaching its $125,000 crowdfunding goal on Wednesday (May 14). 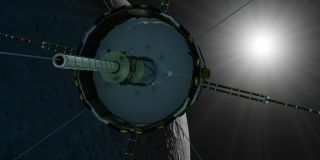 The ambitious private project, the first of its type, is attempting to reuse the International Sun-Earth Explorer 3 probe (ISEE-3), which launched in 1978 and ceased science operations in 1997. "Next week is crucial to the success of our project," project co-leader Dennis Wingo wrote in an update after the crowdfunding goal was reached. "Using the dish at Arecibo gives us the best chance of being able to command the spacecraft in the very near term," Wingo added. "Every day is exceedingly important to us right now. The spacecraft gets about the distance from the Earth to the moon closer each day, and now every day the amount of propulsion burn it takes to make the trajectory correction grows." He added that, in all likelihood, the team will need even more money to extend ISEE-3's mission. The team intends to move the spacecraft to the Earth-sun Lagrange Point 1 (ES-1), a gravitationally stable spot about 930,000 miles (1.5 million kilometers) away from Earth. But what ISEE-3 will end up doing is not known at this point. It could chase down a comet or study space weather, project leaders have said. ISEE-3 has led an interesting and varied life so far. After leaving Earth in 1978, it examined cosmic rays and the solar wind from ES-1. The probe was then renamed the International Cometary Explorer (ICE) and, in 1985, pursued and flew through the tail of Comet Giacobini-Zinner. The spacecraft then was redirected to fly near the famous Comet Halley in 1986. In 1991, NASA shifted the spacecraft's operations to look at coronal mass ejections (explosions of very hot plasma) from the sun's surface, which it did until 1997. ISEE-3 is now in orbit around the sun. Project co-leader Keith Cowing told Space.com earlier this month that ISEE-3 still has fuel on board, and both of its transmitters are functioning properly. At least some of the probe's instruments might still be working, but nobody will know for sure until contact is made, he added. Making contact with the probe will be a complicated procedure, given that the equipment NASA used to talk to the spacecraft no longer exists. Several former and retired NASA officials are helping with this effort, but the agency itself has committed no funding.